With more than 1,550 activities, iTooch 3rd Grade Science is a fun way of practicing and learning Science for third graders. It is, by far, the largest collection of educational worksheets based on the US National Common Core Standards on Google Play for elementary school. I just downloaded your apps. Wow. They are amazing. I have been using the tablet for over a year in my class and I have to say that this is one if the best apps I have seen in a long time. 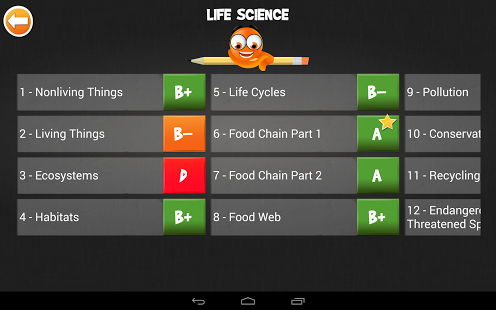 iTooch 3rd Grade Science is by far the most comprehensive educative tool on Google Play for students in Grade 3. Discover our other apps iTooch 3rd Grade Math and iTooch 3rd Grade Language Arts on the Google Play Store. Our apps are available for 1st Grade, 2nd Grade, 3rd Grade, 4th Grade, 5th Grade, 6th Grade, 7th Grade and 8th Grade in Language Arts, Math and Science. iTooch apps comply with the US National Common Core standards for K1, K2, K3, K4, K5, K6, K7 and K8. I loved it but I could open all next levels when my son did the previous one and now he did one and it did not open the next one! Is this because you changed this ? Great Only rates fir free chapters,but it’s still awesome. My son love this apps so much..